Singapore Government Spends $400 Million To Invite International Students To Study In Singapore? On Monday, Education Minister Heng Swee Keat had revealed that the Ministry of Education (MOE) has given international students tuition grants of a total of about $210 million per year. He also revealed that 1,700 international students and 2,200 university students had received tuition grants. When you look back at what MOE had revealed in 2011, you will be able to get a clearer picture. MOE had said that, “almost all PRs and IS (international students) are in receipt of MOE’s Tuition Grant (TG) scheme“. So, wait a minute, Heng had said that 6% (of each matriculation cohort) or 1,700 in the polytechnics and 13% or 2,200 the publicly-funded universities had received tuition grants. And if “almost all … international students are in receipt of MOE’s Tuition Grant scheme”, then what does this really mean? If it might be unclear at first, it is because of the way the reply was phrased. On first reading, you might think that only 6% of international students in the polytechnics and 13% of the international students in the universities receive tuition grants, right? Actually, no. The 6% and 13% actually refers to the proportion of the total student population, including Singaporeans. Then how many international students are there exactly? For the purpose of this article, we will zoom in to look at the university cohort. 18% University Students Are International Students, 13% On Tuition Grants, 5% On Scholarships? MOE had revealed that, “for the past ten years, … the number of International Student (IS) (is) at 20% of the total intake… For example, in AY2011, IS comprised 18% while PRs were 4% of undergraduate intake.” So, if there were 18% international students, and only 13% had received tuition grants, what happened to the other 5%? So, that means that for the 5% international students who had not received tuition grants, were they already on scholarships? And for the 13% who had received the tuition grants, do they receive additional scholarships thereafter? In fact, Heng shared that, the international students in the polytechnics who received tuition grants went down from 9% in 2010 to 6%, whereas in the universities, it went down from 18% to 13%. Does this mean that the proportion of students who had received scholarships had went up instead? Last November, I had written about how Singaporeans pay the second highest university tuition fees among the high-income countries and how Singaporeans also receive the lowest scholarships. 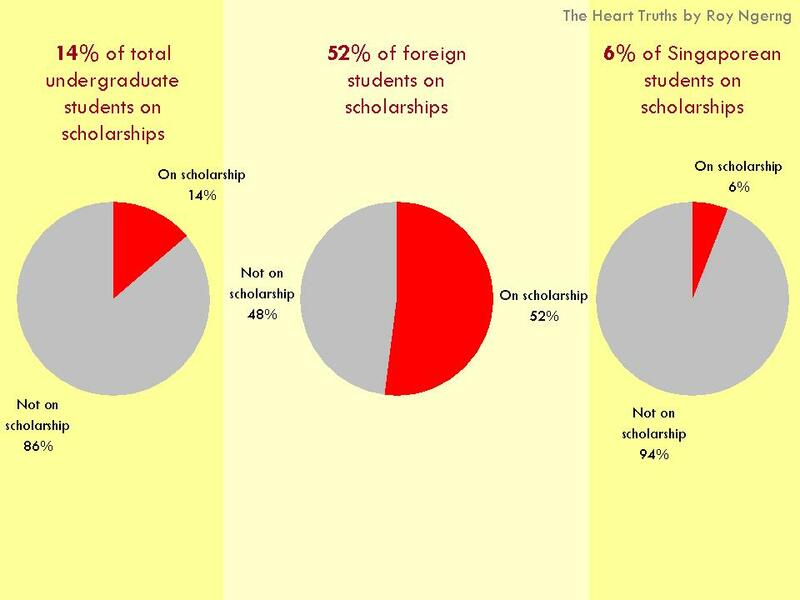 I calculated that when you breakdown the proportion, you would realise that actually, there were 52% of the international students who were on scholarships, and only 6% of Singaporeans who were on scholarships! Thus if 52% of the international students were on scholarships, it would mean that of those who had tuition grants, there would be a substantial proportion of them who were on scholarships as well – what this means is that for a sizeable proportion of international students, they were being sponsored to study in Singapore for FREE. Meanwhile, how many Singaporeans could actually study for free? Government Gives International Tuition Grants Of $210 Million, Gives Scholarships Of $185 Million? 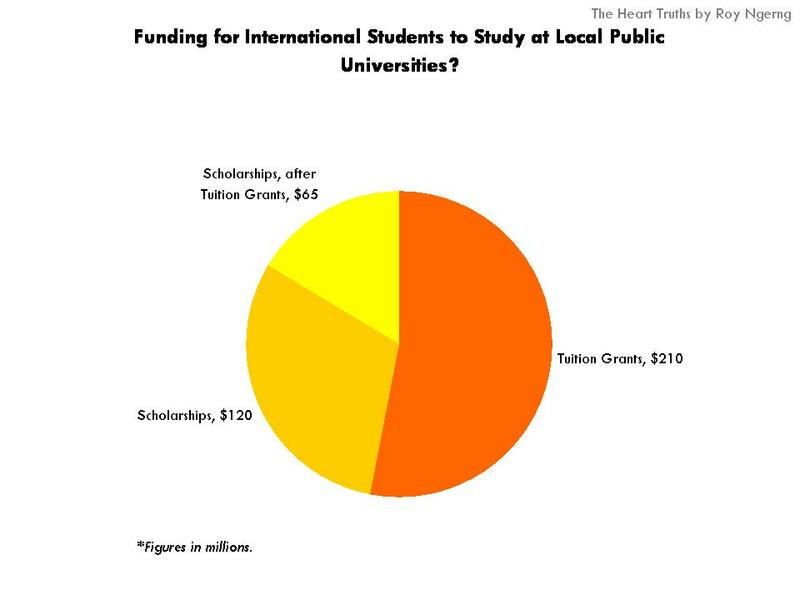 So, we were told that international students had received tuition grants of $210 million every year. But what if we were to include the scholarships? Based on a rough estimation, for the 5% who did not receive tuition grants but who could have received scholarships, about $120 million should have been spent on them. Of those who had received tuition grants and who would also have received scholarships, about $65 million should have been spent on them. In total, there could have been $400 million spent by the government to bring in international students to study in Singapore. So, the $210 million revealed on Monday doesn’t show the full picture. $210 million represents only the grants given out as tuition grants. But when you add in what was given in scholarship, this amount might be substantially higher. What’s more, we haven’t even added in bursaries. Now, let’s put the possible $400 million into a bit of perspective. If you just look at how much Singaporeans would have to pay for university tuition fees, this $400 million might actually enable all Singaporeans who are currently studying in the local public universities to study for FREE! Why does the government keep claiming that they are providing so much subsidies for Singaporeans? When you look at the subsidy that the government gives to Singaporeans for non-lab courses, this is only $19,100. 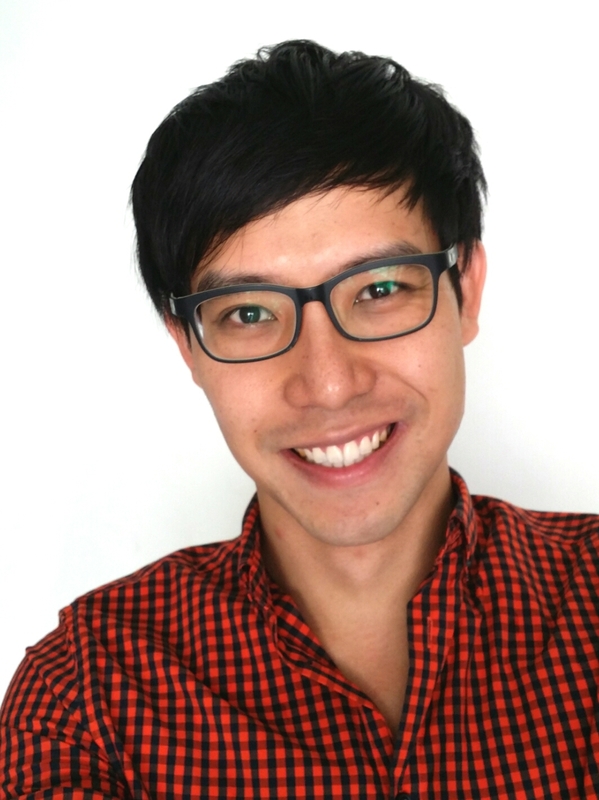 Singaporeans still have to pay $7,650 out of our own pockets, or about 40% of the subsidy. On the surface, 40% is a discount. But when you compare what Singaporeans pay with what the citizens in other high-income countries pay, Singaporeans actually pay the second-highest university tuition fees, after Ireland! So, when you look at it in perspective – from how much Singaporeans actually have to pay out from our pockets, it is not cheap. In fact, for Singaporeans, we have to pay one of the highest university tuition fees in the world. Meanwhile, why is it that for the international students who come, there is a substantial proportion who would be able to study for free, but not for Singaporeans? And why is it that for whatever the government is paying for the international students to invite them to study in Singapore, the government might actually be able to let all Singaporean university students study for free? Something is very wrong when your government has enough money to let its citizens study for free, but they choose to give that money to other people, other than its own citizens, right? Singapore Government Spends Least On Education, Priority On International Students Over Singaporeans? Not only that, I had also written about how the Singapore government spends the lowest on education as a proportion of GDP, as compared to all the other high-income countries. If the Singapore government is already so stingy with how much they spend on education, why would they prioritise what they spend on international students? Why are they not prioritising their spending on Singaporeans? And if they want to prioritise their spending on international students, shouldn’t they then increase their expenditure on education to ensure that Singaporeans also receive at least the same benefits? Hello! We are the people who vote you into power! We are the people who have a long-term stake in this country, and who would be here to work with you to make Singapore a success story! Hello, we are the Singaporeans! Why has this government forgotten all that the Singaporeans have given them, and decide to neglect the Singaporeans and spend their time buying international students over? Hello! Which government in the world does that? Which government treats its people as second-class citizens while giving international students who might not have a stake in this country first class treatment? Hello?? 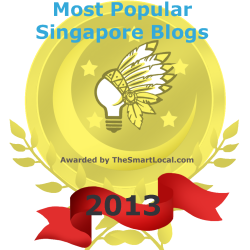 Singaporeans, if you haven’t realised, we might have just done ourselves in. In the aftermath of the transport fare increase, and in the face of the pending increase of the MediShield premium and Medisave contribution rate, do you have something to say about how the government apportion budget for Singapore? Do you think the $1,000 wage that the government wants to legislate for cleaners is enough? Do you think more workers should earn a minimum wage and do you think the minimum wage should be higher? 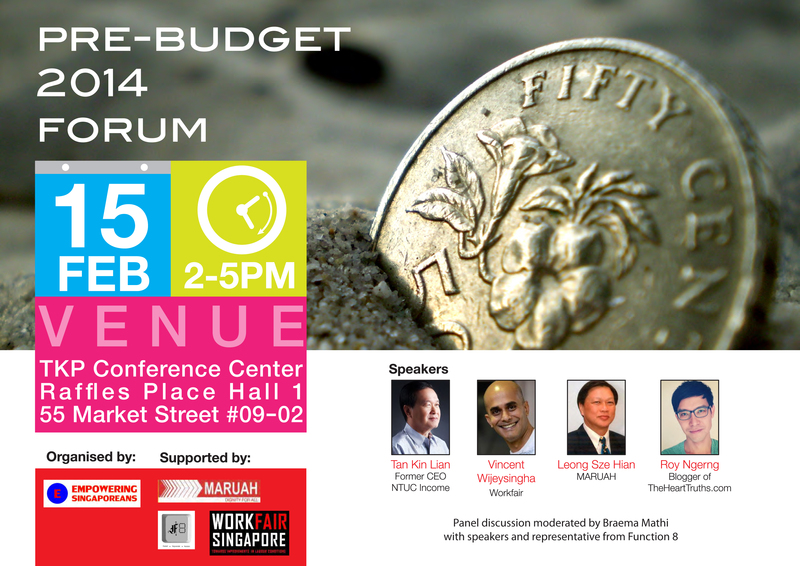 Come join us at the Pre-Budget 2014 Forum, where we would be discussing these issues and sharing with you our recommendations and proposals. This event is jointly supported by MARUAH, Function 8 and Workfair. You can find out more about the event at the Facebook event page here. I really don’t understand why the government gives so much to foreign students who mostly leave singapore after graduation. Its really infuriating when there are so many brilliant singaporeans that deserve these scholarships and many more poor students that need grants/ bursaries but this money is channeled to foreigners instead. The PAP leeders always like to put things in perspective. The following from Andrew Loh’s FB gives us another perspective. Really want to shove it in the PAPs’ face and ask for their perspective. Medifund gave out S$102 million to needy patients in 2012. The tuition grants for international students total about S$210 million per year. [Source: Ministers’ parliamentary speeches and answers to questions, Jan 2014). Just a reminder, they promise to do more to help. And so, they will need to raise taxes. Outrageous! Using taxpayers’ money to fund foreigners & hiding the facts from us. Are we a welfare state for international students? Hey guys, you will be more outraged by the amount government gives to SME, NTUC, SMRT and SBS. You will even be more more outraged by the amount government donates to the PRC government at Tianjing and Suzhou. And the amount of resources diverted to build HDB for PRCs. HDB, PUB, EDB, URA and other stat boards all have offices there. Go check out all the monkey businesses and property developments there where billions are poured into a blackhole. Mountain high, king far far. Except that the king is in it and we are the one far far know nothing. Exactly. Please get your friends and their friends to speak out and let’s change Singapore into one that will protect you, and ensure that all Singaporeans are protected. I have enough of stubborn scholars who think they are much more superior than us -just because they are 1-2 years older than us and have learnt whatever we are being taught – and thus are not open to our opinions at all and insist on doing things their way. HELLO THIS IS SINGAPORE AT THE VERY LEAST PLS SHOW SOME RESPECT FOR OUR OPINIONS AND NOT EXPECT US TO DO THINGS YOUR WAY..
That said, this applies only to the majority of scholars (esp. China) that I’ve encountered and is not representative of the entire scholars population. Fact: The percentage of international students are capped at 20%. This does not mean that Singaporean universities will definitively have 20% international students at any time. Fact: In 2011, 18% of the matriculation cohort are international students. In 2014, 13% of matriculation cohort who are international students received tuition grants. You link the 18% in 2011 to 13% in 2014 to derive a 5% variance. This is statistically wrong because you cannot empirically determine if 100% of the 18% in 2011 has remained in 2014. What about those who graduate from Singaporean universities between 2011 to 2014? Fact: Using the same logic that you derived that almost ALL international students are on tuition grants, then it means that there are 2,200 international students in Singaporean universities today. This is how I derive the number of international students for Singaporean universities. Fact: Based on the above, you have no empirical evident to suggest that there is “5% missing international students who did not receive tuition grants”. If you don’t have any empirical evidence to back up your assertions, then the rest of your article that is dependent on this missing 5% are hypothetical and not statistically relevant to the discerning reader. Fact: How does the reduction of the percentage of total matriculation cohort of international students on tuition grants positively correlate with the proportion of international students who have received scholarships? What is your empirical evidence for this? Is this a hypothetical statement? Fact: It is true that a majority of international students are here on scholarship. This is a known fact. It also means that 48% of foreign students are paying 70% higher tuition fees than Singaporean students studying in the same matriculation cohort. If the 70% higher tuition fees relative to Singaporeans represent the actual value of a university education, it means that the Singaporean government is sponsoring 70% of the total university cost for 94% of all Singaporeans and PRs studying there. Fact: 54% of all scholarships comes from the industry. They represent sectors such as engineering which finds it difficult to attract graduating students to their industries. Fact: In AY2010, a total of around 30,300 Singapore Citizens received a scholarship or some form of financial assistance which helped fund their undergraduate education. Using your same analogy, these scholarships, plus tuition grants will mean that these 30,300 students will receive FREE education as well. “So, we were told that international students had received tuition grants of $210 million every year. But what if we were to include the scholarships? Fact: There is NO 5%, so your assertions which are dependent on this 5% is moot. Secondly, there are students who receive scholarships and tuition grants (which you cannot verify empirically) do not necessarily get the scholarship from the government. More than 50% of ALL scholarships offered to undergraduates are funded by private companies. Fact: It is also true that we have the 2nd lowest corporate tax rate in the world (after Hong Kong) and a progressive tax rate where individuals who earn up to $20,000 p.a. pays no taxes. Taxes start at those who earn $30,000 and more at $350 p.a. Based on these low tax rates, the SIngaporean government provides subsidized health care, subsidized sports, subsidized transportation, and yes, subsidized education. Everyone with vested interest in any of the budget line items would want what they lobby for to be free. But that is unrealistic mathematically and politically. “Hello! Which government in the world does that? Which government treats its people as second-class citizens while giving international students who might not have a stake in this country first class treatment? Hello?? Fact: The pioneer generation package treated Singaporeans as 1st class citizens. Students with the capacity to earn their living vis-a-vis those who are older and incapacitated should bear some burden for their investment in education. I would recommend that you revisit your assumptions before making further commentary on this matter. Dude, the information I’ve shared has also been shared in parliament. Perhaps if you want more clarity, you go ask your dear PAP to reveal all the information instead of tell Singaporeans that it is not in our interest to know too much, and so hide the information from us. Next time, before you point the finger at someone, point the finger back at yourself instead. In this time of deceit and lies, he who speaks out for the corrupt and marginalise his own people is a traitor. I would recommend that you revisit your allegiance – whether to yourself or the people of Singapore. Interesting. The PAP seems very scared that this information is now known. Looks like they are sending people to comment on blogs regarding these education statistics now. I wonder why the PAP is scared – is it because of the amount they are giving to foreign students or the high amount they are making Singaporeans pay? Or what this two combined can mean to their hold on power? no, I post this in my personal capacity because I cannot stand pple who fudge data to mislead the public for his own agenda. Please read the article for the analysis of the statistics. I would just like to point out that after considering the Tuition Grant, I pay SGD 14,100 per annum as fees. My fellow PR friends pay SGD 9,850. And my Singaporean friends pay SGD 7,050. For the same course. Also, in addition to this, please note that I have a compulsion to work in Singapore for 3 years upon graduation, while my fellow PRs and Singaporean friends are free to pursue the best opportunity there is, regardless of it’s location. Also, please note that I pay for my rental/accommodation costs in addition to the above fee(~ SGD 15,000 p.a), which comes in as forex into Singapore, which helps it’s economy. So, please, get the misconception out that ‘International Students’ are being preferred over the local students. No government does that. We deeply appreciate the hospitality and opportunities extended to us by the people and government of Singapore, but we do our fair share by giving back to the country/economy. Please do a fair and complete analysis in the future. is there any other web page which give these information in quality? Never use any shortcut methods while cooking, handling and cleaning cookware unless you are hundred percent sure of its success. I know of a bangala who came to Singapore on free scholarship to do electrical engineering. He became a manager at a electrical firm. Our NSmen had to serve his own country on pathetic pay in order to get into local university. He still has to pay for his own lodging and food. ?!?! Can the Singapore government explain this? What Can $860 Million The Government Wants To Give To World Bank Do For Singaporeans?